I ♥ Etsy. You know I do and have for years. It is where my skin care line was discovered by the press and it really gave me the arena to have my business soar until the day I chose to close up shop. However, one of the things I am asked most in emails from readers is to look at ingredients from Etsy sellers and to please let them know if products are safe or not based on those ingredients. I ♥ small businesses. Supporting small business is a HUGE part of this blog and has been for 5 years. That said, it is important to be smart and choose wisely. 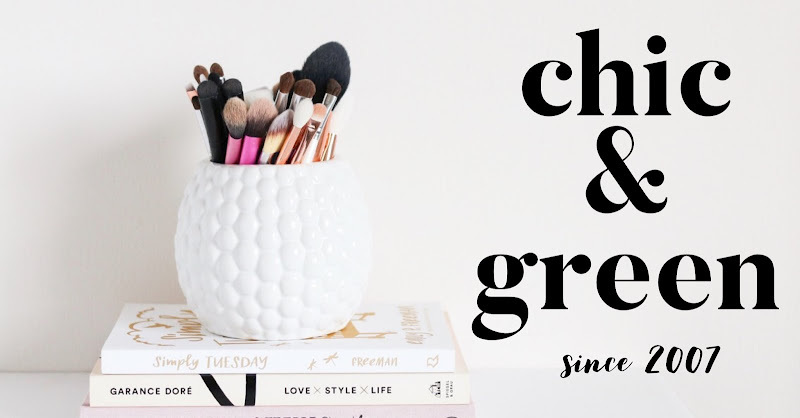 Today I'd like to take a look at some items from Etsy (brand names have been cropped from photos so people don't get mad) and talk about the labeling issues that are going on. 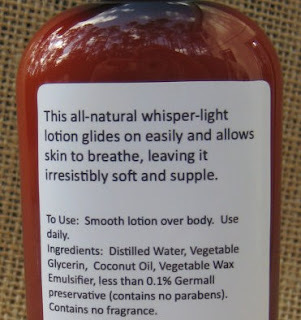 Take a look at a Florida-based lotion company found on Etsy, which claims to be "all natural", yet still contains Germall preservative. In other words, this lotion contains Propylene Glycol, Diazolidinyl Urea, and Iodopropynyl Butylcarbamate. Is that sounding nice and wholesome to you? All natural means ALL, as in 100% natural. This is not a 100% natural product. 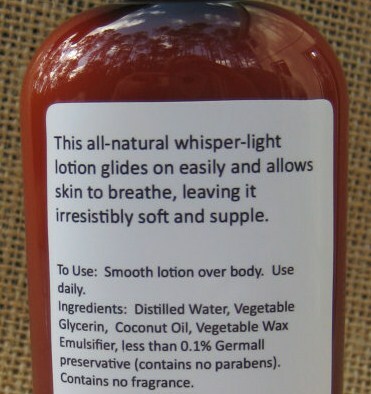 The above lotion is another advertised as all natural. It is available in sweet pea and cucumber melon, which are fragrance oil-based and again cannot be called all-natural, as these are not natural ingredients. Purified Water, Sunflower Oil, Shea Butter, Vegetable Glycerin, Emulsifying Wax, Stearic Acid, Aloe Vera, Optiphen (Paraben Free Preservative), Potassium Sorbate (Food Grade Preservative), Fragrance, and Inner Beauty. 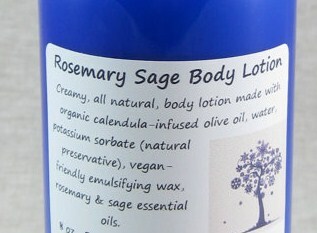 The lotion above bills itself on Etsy as all natural as well. It comes in scents such as Blackberry Sage and Moonlight Waltz--not 100% natural--these are synthetics once again. 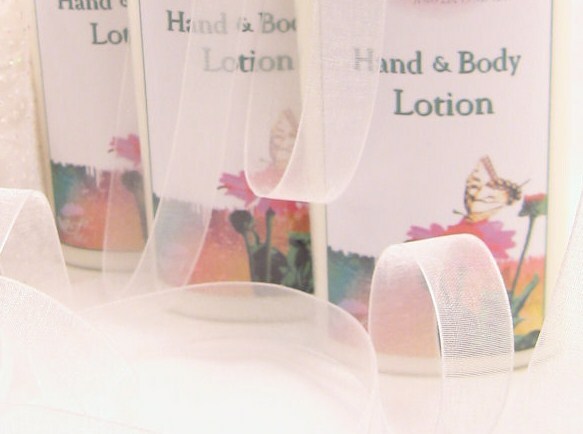 *Handmade skin care should not, in my professional opinion, be crafted and offered for sale by people without a strong skin care background, formulation knowledge, understanding of cosmetics chemistry and aesthetics. You wouldn't spend your money to learn ballet from someone who has never danced before, would you? Would you spend money for someone to cut your hair with no knowledge of cosmetology? No, you wouldn't. It is the same thing here. *Companies, no matter how small, MUST label their full ingredients on the products. This is in compliance with FDA labeling guidelines for toiletries and cosmetics. If the product is boxed or package, the company can label that. Whether you are buying a lip balm or a lotion or an eye shadow, the company MUST disclose the ingredients with each product. *Make sure the company is using appropriate packaging. I cannot tell you how many skin care serums are selling on Etsy right now that are stored in clear glass. This exposes the essential oils to light and degrades them. Do not purchase if they are not in light-protective glass such as cobalt blue or amber. *Be wary of companies claiming an SPF level on their products. Sunscreen is regulated as a drug, as is antiperspirant. A company legally cannot say that their lotion is a sunscreen with an SPF of X number if they haven't classified it and labeled it as such in compliance with FDA guidelines. *Avoid handmade creams and lotions made with water or other liquids such as hydrosols or aloe juice that are inadequately preserved. If they claim to be "preserved" with Vitamin E (an antioxidant, NOT a preservative) or Grapefruit Seed Extract (not effective in water-based formulas), know this is inaccurate and you could be risking your health by using it. This lotion is free of harmful chemicals and is safe for everyone, even babies! When kept at room temperature, this lotion will keep for 6-8 months. If kept in the refrigerator, it will last longer. 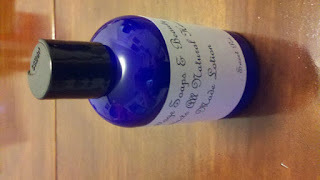 We keep our own personal lotions at room temperature and we have never had a lotion "expire". The product the seller is referring to actually lists not preservatives in this water-based recipe which are proven to be stable in water-based formulas. While the seller may not notice anything "expired", I am 100% sure that if she sent her products to a lab for testing that the challenge testing would reveal microscopic, possibly deadly mold spores, staph, bacteria, and other harmful microbes not visible to the naked eye. I think lab challenge testing should be a legal requirement. 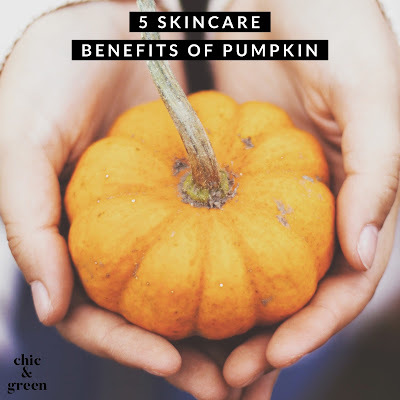 There are just as many wonderfully professional skin care companies out there as questionable....just be cautious before you buy!